Just over a week ago, I finished up work in Valemount and had to drop a coworker off in the Vernon area. With Janean off camping, I figured it would be nice to take advantage of the fact I was already in the Okanagan area and spend the next day and a half enjoying the natural history of the southern interior. After dropping off my coworker, I made a quick dash south and completely forgot how busy it would be during the Canada Day weekend. I had trouble finding accommodations in Oliver, so I kept going to Osoyoos and eventually managed to find somewhere that was not excessively expensive. My plan for the next morning was to get up and head to Road 22 to see if dragonflies were cruising the irrigation channel. When I got there it was still a little early, so I continued on to Black Sage Rd. and realized the area sported an abundance of antelope-brush. I had a feeling the area was Haines Lease Ecological Reserve due to provincial government signs indicating it was a management area. If I have an area I can just wander without worrying about trespassing, I am happy. Off I went in sandals... into the sage, antelope-brush, cheatgrass, and cactus. After a couple minutes, I marched back to the truck and replaced my sandals with hiking shoes. I always underestimate how effective cacti and cheatgrass are at transporting themselves from just the slightest brush of a foot. The shoes made it a bit more comfortable, but I still had hundreds of cheatgrass seeds embedded in my shoelaces and socks and cacti were embedded in my soles and adhering to my pants. So why was I putting myself through this treacherous foot gauntlet? 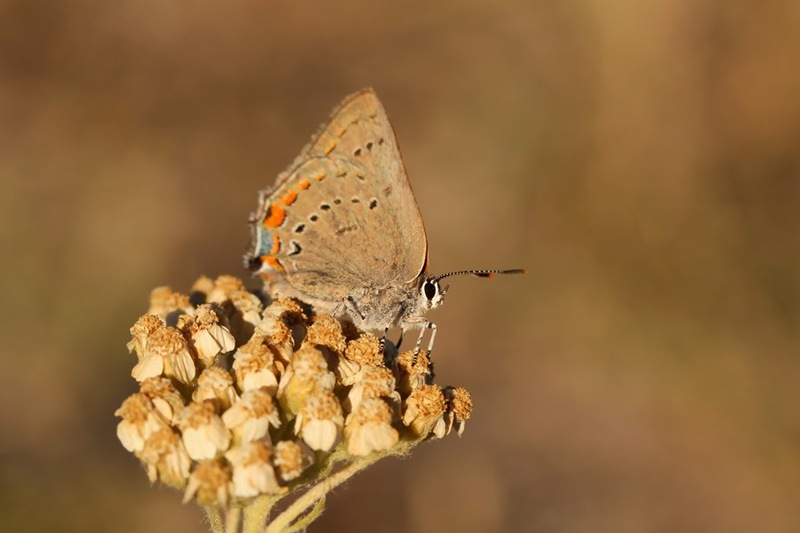 The relatively intact antelope-brush community hosts a butterfly that has a very limited range in British Columbia: Behr's Hairstreak. 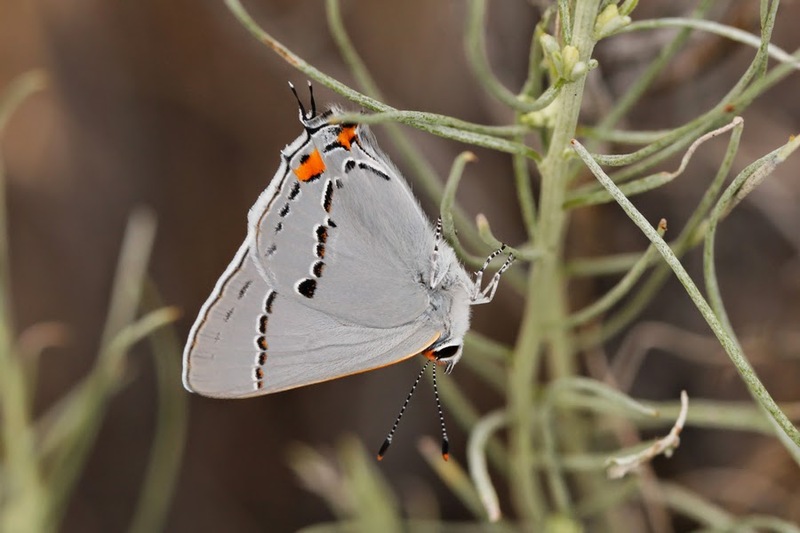 I spent hours roaming around a slope covered in antelope-brush and, despite finding dozens of Grey Hairstreaks, a few California Hairstreaks, a couple Common Sootywings, and several amazing robberflies, I just couldn't connect with Behr's Hairstreak. I have seen one before, but it a very brief sighting at the Osoyoos Desert Centre a few years ago. I have been told the desert centre's parking lot is one of the best places to see them due to the abundance of yarrow in the garden. I am stubborn and wanted to get it in a more natural setting. Haines Lease has a good supply of its host plant (antelope-brush), but I feel it was lacking nectar plants. Pretty much all of the yarrow I encountered was already dried out. I was happy I explored this location despite missing my target. I even scrambled up onto the rocky slope above the antelope-brush community and got one heck of a surprise from a Western Rattlesnake! This encounter happened so quickly that I didn't manage any photos, unfortunately. Instead, I can offer shots of a Grey Hairstreak, Common Sootywing, and a Brown-spotted Range Grasshopper. 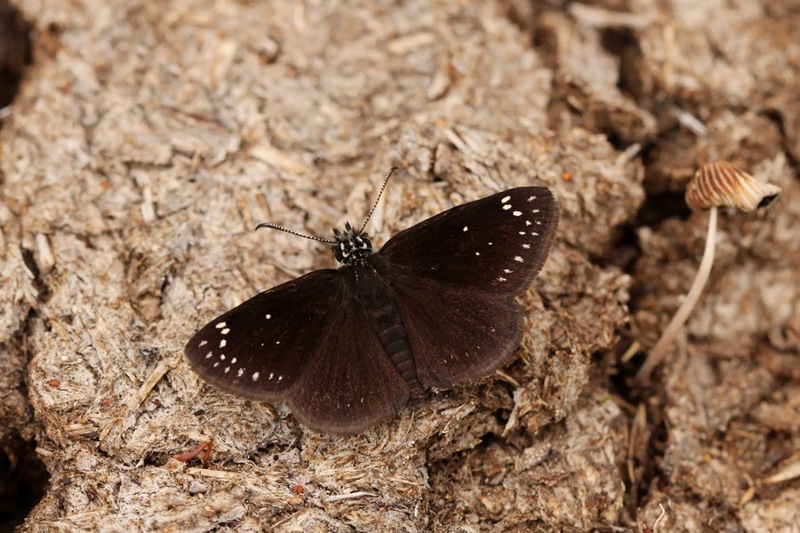 I decided that I had to abandon my search for Behr's Hairstreak. 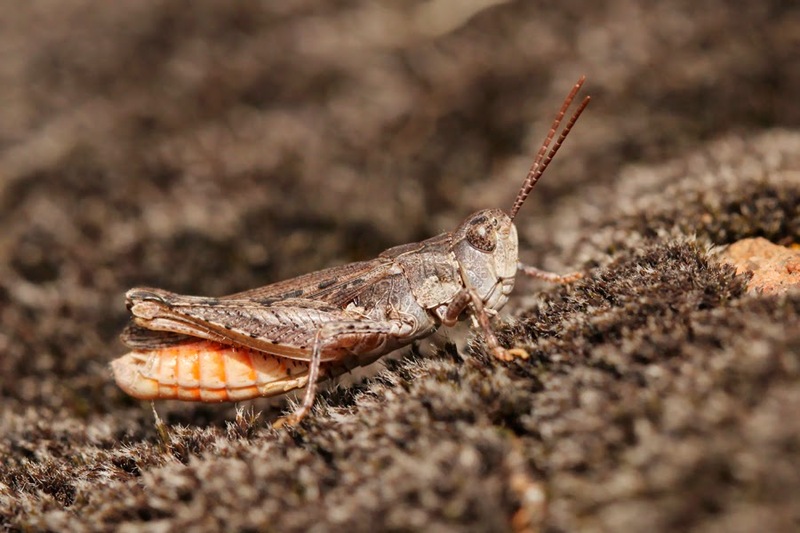 Between my time at Haines Lease Ecological Reserve and another little patch of antelope-brush further northwest on Black Sage Rd., I had dedicated enough time to one species. I cut decided to shift my focus to Dark Saltflat Tiger Beetle (Cicindela parowana), which is currently only known from one location in Canada. For this species, I headed out east of Oliver. I didn't have the exact location for it, but a description of the area that I did my best to figure out. I later found out I wasn't quite in the right spot. I was having a hard time finding good tiger beetle habitat, so I was sticking to a dirt track that occasionally had some looser, sandier soil. Based on a report chronicling the search effort for Dark Saltflat Tiger Beetle in recent years, I thought I should be looking around alkali flats. I got on my phone and used Google Maps to look for any water features that might have an alkali edge. From my little iPhone screen, I found one spot that looked like a decent candidate. I drove a few kilometres on the dirt track and ended up at a little watering hole that seemingly gets used by horses. This wasn't looking too promising. I hopped out and started searching the dried edge for tiger beetles and the wetter areas for interesting plants or puddling butterflies. Nothing. I then continued to walk down the dirt track. As I walked along, my eyes were drawn to a dark spot on the flat-topped flower cluster of a yarrow plant. It was a butterfly and the combination of its size and brown tone stopped me dead in my tracks. Behr's Hairstreak! I had given up on finding one, but that's often how it goes. 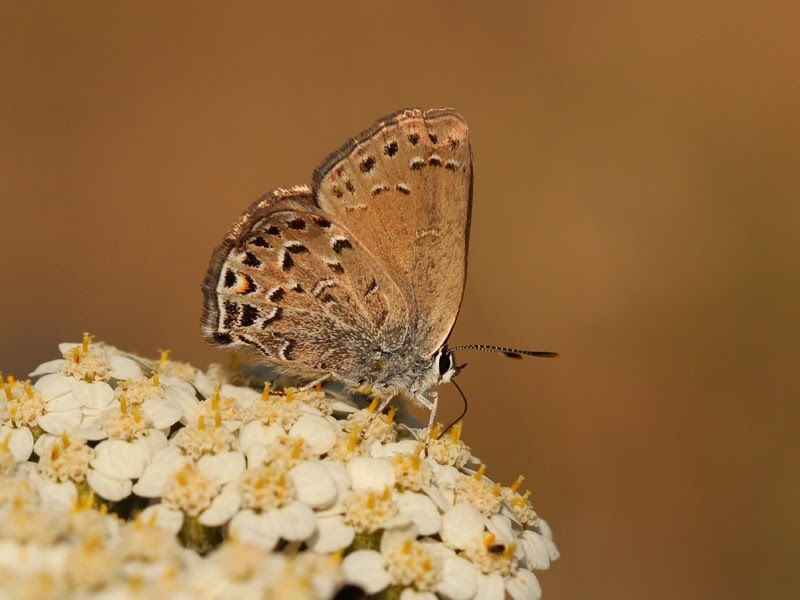 This stunning hairstreak cooperatively nectared from flower to flower on the yarrow. Behr's Hairstreak is easily one of my favourite butterflies in British Columbia - what a beauty! I should really end with the Behr's Hairstreak as it was really the high point of the day. Unfortunately, I am a sucker for chronology and, after enjoying the above Behr's plus another individual that was a little more worn, I had a cooperative California Hairstreak. Yarrow is such a great nectar plant even if it is rather weedy, and it's also what the California Hairstreak was using for a nectar source. I may have spent my entire day searching for two main targets, but it was a very rewarding day and I hope you enjoyed ride-along narrative.